Watch Bald Mountain Rounders on YouTube. 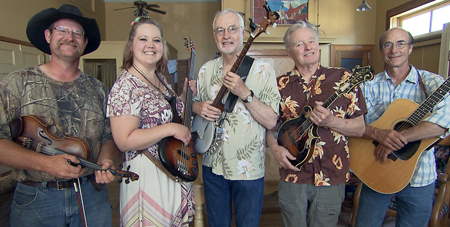 The Bald Mountain Rounders are a Bluegrass band offering audiences many pleasant surprises. From the up-tempo contemporary arrangements of bassist Kassy Brooks to the down home humor of Robin Smith playing mandolin, with Wallace Selby on the fiddle, the traditional sounds of country music sung by Jack Honerkamp playing guitar are rounded out by regionally acclaimed folklorist Norm Martin playing the five string banjo. Audiences connect with the tight vocal harmonies of this group who sing their way into the hearts of multi-generational audiences with music from by-gone eras as well as styling’s of contemporary genres. With over 120 years of combined musical experience the Bald Mountain Rounders' unique act offers a show that always leaves audiences wanting more. Their traditional Bluegrass sound evokes images of cool summer evenings in the Great Smoky Mountains of Appalachia to lovers crossing the wide rolling prairies of the grasslands to the spiritual connections of the Black Hills of South Dakota. Their uptempo arrangements of modern stylings may have audiences tapping their toes or even dancing in the aisles. All of the Bald Mountain Rounders live in the small town of Chadron in the Pine Ridge area of the Panhandle of Western Nebraska. Some people think it is the middle of nowhere but when they hear the sound of this band they know they are in the center of everything. The Bald Mountain Rounders demonstrate that there is a good life “behind the corn curtain”. Technical requirements: Two standard electrical outlets and a covered stage for outdoor venues. Please call for details. Availability: Statewide, year round for concerts, festivals and special events of all kinds.